Click on the banner above to go to the Rutherford B. Hayes homepage at the University of Virginia's Miller Center. 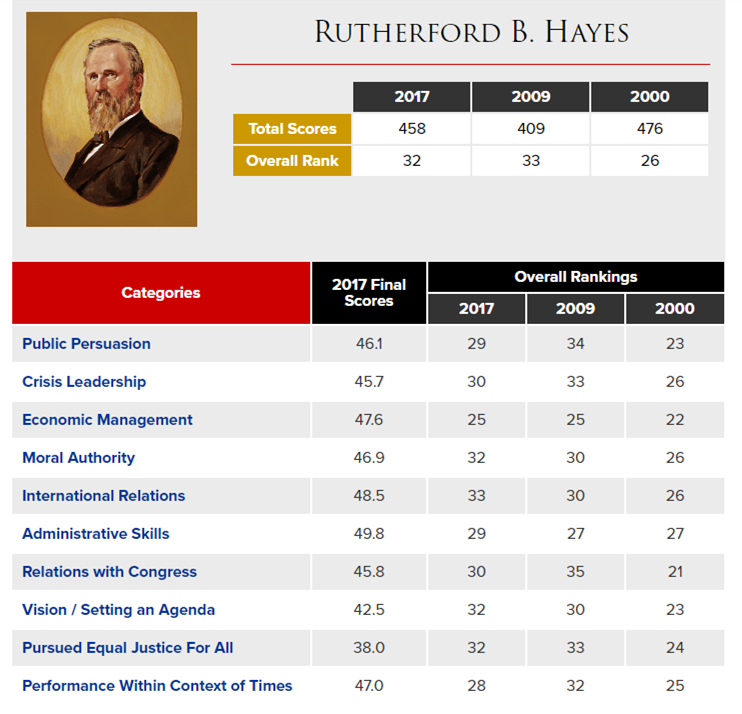 Click on the buttons below for in-depth information about Hayes' Presidency. By the mid-1870s, people had grown tired of the Republican Party's obsession with Reconstruction (a period of time after the Civil War during which the South was "reconstructed"). In the Presidential Election of 1876, the Democratic candidate Samuel J. Tilden won the Popular Vote 50-47% and was beating the Republican candidate Hayes in the Electoral Vote (but was one Electroal Vote short of the necessary majority) when a deal was struck. The election hinged on three Southern states (Florida, Louisiana, and South Carolina). Hayes had won these three states (and their 19 Electoral Votes), albeit questionably (just look at the map above - three random "red" states in a sea of "blue"), but they didn't "count" toward Hayes' Electoral Vote total since these three states had yet to officially rejoin the Union. 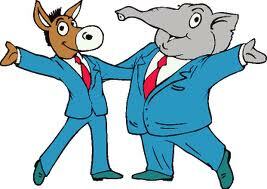 Instead of sending the Election of 1876 to the House of Representatives (per the 12th Amendment), the Compromise of 1877 settled the issue. The Democrats allowed the three states to count, which pushed Hayes ahead of Tilden in the Electoral Vote (185-184) and made him the next President. In return, the Republicans withdrew Federal troops from the South and ended Reconstruction. The agreement, dubbed "The Corrupt Bargain", earned Hayes the nickname "Rutherfraud". 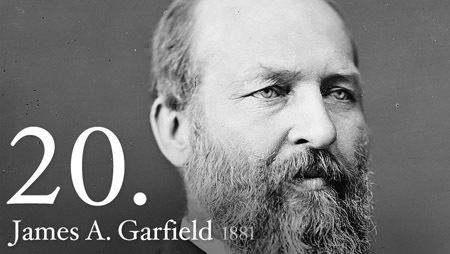 The Presidential Election of 1876 was a pretty shaddy ordeal. The results were contested for months and eventually ended with a "Special Electoral Commission" of five members each from the House, Senate, and Supreme Court deciding the results. With all but one Supreme Court Justice voting, the results were tied 7-7 between Hayes and Samuel J. Tilden. The last justice was David Davis, an Independent. However, before the Commission could make its decision, Davis was elected to the Senate by the legislature of Illinois. His replacement was Joseph P. Bradley, a Republican. 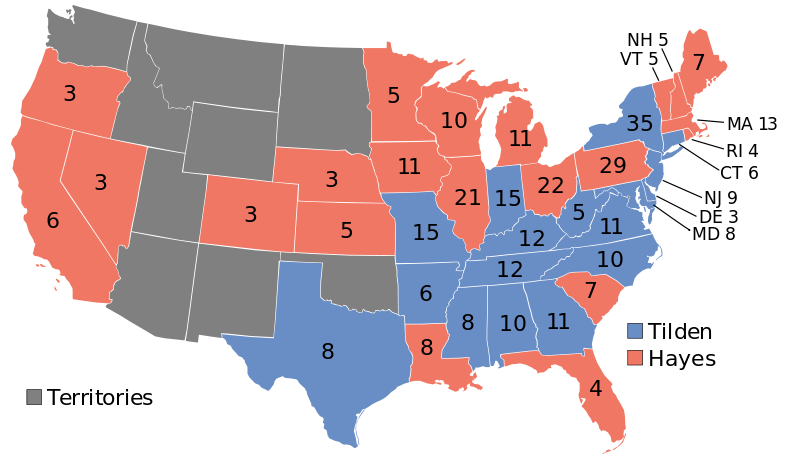 Thus, the deciding Electoral Votes were awarded to Hayes by an 8 to 7 vote as part of the "Compromise of 1877". 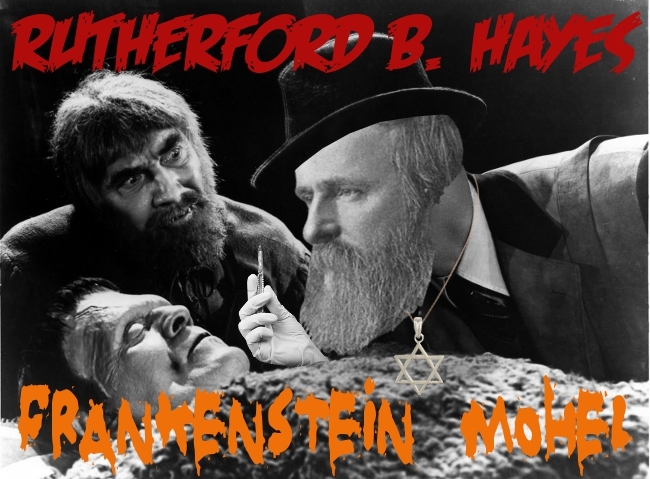 The nickname "Old 8 to 7" is a negative nickname given to Hayes in reference to the way in which he was elected. There have been a total of five U.S. Presidents elected without winning the Popular Vote: John Quincy Adams (1824), Rutherford Hayes (1876), Benjamin Harrison (1888), George W. Bush (2000), and Donald Trump (2016). Arriving in San Francisco, California on September 8, 1880, Hayes became the first President to visit the West Coast while in office. While many of the Presidents that came before him were lawyers (or "read law" - which means they entered the profession before law schools existed), Hayes was the first President to actually graduate from a law school. After briefly "reading law" in Columbus, Ohio, Hayes moved out east to attend Harvard Law School. He received his LL.B. (Bachelor of Laws) in 1843, passed the Ohio Bar in 1845, and opened his own law office in Lower Sandusky (now Fremont). Hayes' wife, Lucy, was a big supporter of the Temperance Movement (to ban alcohol). As such, historians have given her the nickname "Lemonade Lucy". Contrary to popular belief, it was Hayes (and not Lucy) that banned alcohol from the White House. Hayes' wife, Lucy, was the 1st First Lady to graduate from college. She was a member of the Class of 1850 from Wesleyan Women's College (which later merged with Ohio Wesleyan University). Hayes signed into law an act that permitted women to plead before the U.S. Supreme Court. The first White House telephone was installed, by Alexander Graham Bell himself, when Hayes was President. The White House phone number was "1". The first Easter Egg Roll on the White House lawn was conducted by Hayes and his wife, Lucy, in 1878. Originally, children in Washington, D.C., would flock to Capitol Hill the Monday after Easter for egg rolling and a day of activities. Members of Congress grew tired of the huge crowds and passed an Act of Congress that prohibited egg rolling on the Capitol grounds. (Typical Congress, right?) The event was moved to the White House in 1878 after President Hayes was approached by some children to use "his backyard" to roll eggs. Nearly every Easter since, the White House has invited children to roll eggs on the White House lawn. Of the five Presidents that served in the Civil War, Hayes was the only one to be wounded. Hayes was shot in the shoulder during the Second Battle of Kernestown in 1864. Hayes' horse was also shot out from underneath him. Hayes gained prominence as a defense attorney in Cincinnati and was heavily involved in defending escaped slaves accused under the controversial Fugitive Slave Act. As a staunch abolitionist and prominent lawyer, Hayes was noticed by the new abolitionist Republican Party, and was offered an opportunity to run for a seat as a Republican judge. He turned it down, however, and instead accepted an appointment as city attorney for Cincinnati. Just as President James K. Polk had campaigned on the promise of running only once, Hayes also vowed to only serve one term. 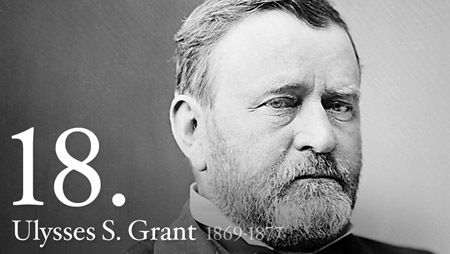 He followed through on that promise, choosing not to run for re-election in 1880. Instead, he became a trustee of Ohio State University and supported many causes and interests, most notably Federal Student Aid, civil rights, wealth disparity, and prison conditions.